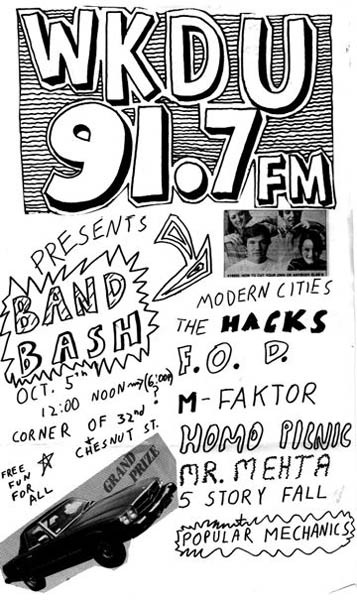 WKDU free band bash from October 1985. There were a lot of bands at this show – most of the Video is of Homo Picnic and 5 Story Fall but there is also some of Oblivion, M Factor, and I think Fabulous Fondas. Apparently more bands where going to play (Dead Milkmen plus others) but the company doing the sound and/or Drexel security pulled the plug. At the end of the 2nd Homo Picnic clip there is a short interview with them. I just realized I forgot to try and figure out the song titles (if anyone knows them please add them in a comment) Also if anyone has the 5 Story Fall or Doctor At Tree demos please let me know it would be great to put those up.